Love or money: what makes the world go round? Is this a course for economists? Not particularly. Economists are as welcome as anyone else, of course, but there’s definitely no need to have a background in economics. Underneath all the jargon and mystery, economics is fundamentally about deciding things that shape all our lives – what we should spend our time doing, and how money and resources should be distributed. This course is about reclaiming those topics. So what is post-market economics? A post-growth society is a society that nurtures the ecological, economic and especially cultural foundations on which it is built. We’ll be looking at practical alternatives. These include Rob’s creation of the Transition movement based around community cohesion; my work with the Ecological Land Co-operative to try and free people from the rent and mortgage traps; and Mark’s experiences of living without money altogether and, now, how he is creating a community based around that. From a theoretical perspective, we’ll draw on the work of the late David Fleming, who was an inspiration to all of us. He earned himself a PhD in economics in order to show how misguided mainstream economics really is. As he wrote, conventional economics “puts the grim into reality” – and his work is all about rediscovering how to rely on each other for what we need, rather than on money. Why is Fleming’s work important? David Fleming was a wonderful man and a former teacher at Schumacher College. He was something of a mentor to Rob Hopkins and me until his death in 2010. Rob once told me, with perhaps a little too much humility, that creating the Transition Network was simply a process of taking the US journalist Richard Heinberg’s insights into peak oil, David Holmgren on permaculture and Fleming on community resilience, rolling them together and making the whole thing comprehensible. David was also heavily involved in the origins of both the UK Green party and the New Economics Foundation, and a chairman of the Soil Association. That sounds good, but how would work in practice? Could we make this real now? Sure – we’re not short of examples. The Transition movement now includes thousands of communities across over 50 countries. Grow Heathrow, for example, is a project started in 2010 in Sipson, a village which would be completely demolished if the Heathrow airport expansion goes ahead. 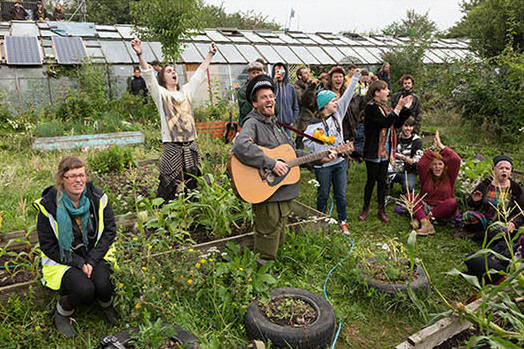 Transition Heathrow decided to take over an abandoned market garden site there and turn it into an inspiring off-grid community project, returning the site to food growing while providing a hub for sharing knowledge and practical skills around sustainable living. It has also provided Greater London homes for a self-reliant community of residents, providing for their needs without paying rent to landlords, or mortgage payments to banks. Or, Mark Boyle’s ambitious project An Teach Saor, The Free House, in the north of Ireland, a moneyless community with free accommodation and a free pub! This project relies on the generous economics of wild nature, which gives continually and unconditionally. By applying human ingenuity to harvesting this bounty we can produce and share great abundance. Or projects like Streetbank, of which Mark is a trustee, make it easy for us to get involved with our neighbours and reduce our need for money wherever we live. As Fleming points out, it’s only over the past couple of hundred years the idea that money makes the world go round has developed. Just as all food used to be ‘organic’, historically it was always relationships and community – the non-monetary ‘informal economy’ – that kept things going. And in many ways it still is: imagine how much we’d have to pay all the parents, neighbours, local cricket teams, allotment holders, friends or magistrates if we tried to pay them for all that they do. Isn’t this just too difficult in the current political and social context? It’s not easy to go against the mainstream story and build something new. But cracks are appearing everywhere in the mainstream economy, and besides, working hard at something you believe in deeply feels a heck of a lot better than doing the easy thing that you don’t. In different ways, all the teachers on our course have experience of the joys and struggles of taking that leap. So is post-market economics about bringing down mainstream neoliberal economics? More and more of us are no longer reassured by our culture’s irrational myth, and are tired of being told by economists that they know best, when we can see for ourselves where we’re headed. What will the course offer, and why now? This course is about our experience of building alternative systems, based in community and permaculture, systems that we’re loyal to and proud to rely on for what we want and need in life. When the globalised neoliberal system is exploitative, destructive and falling apart, a life well lived surely involves grounding our life in new alternatives, or committing to the many that already exist. Otherwise the convulsions of the market economy could leave us with nowhere to turn. Already many feel hopeless as austerity starts to bite, and history teaches that fascism can rise in such a context. It is important to remember that the likes of Mussolini and Hitler didn’t consolidate power only on the basis of lies and fear – they also addressed popular concerns over wages, unemployment and working conditions. So to avoid the drift towards fascism, we need to present an alternative vision of how people can support themselves and their families. We want to tell a beautiful story of how we will make the future, as an alternative to that fearful, hateful one. How practical are such radical ideas to teach? Are they realistic? Definitely. I say that with some confidence, because ten years ago David Fleming taught on a similar short course at Schumacher College in 2006. That was the first time I met him, and it completely changed the direction of my life. It was also where Rob Hopkins first met the people he would go on to co-found the Transition Network with. So who knows what amazing initiatives may grow from this immersion in what Charles Eisenstein calls “the more beautiful world our hearts know is possible”. Reading Fleming’s work doesn’t quite feel like learning something new. To some extent that’s because of his warm and engaging writing, but I think it’s more because he’s just translating what many of us know and yearn for already into a practical framework. And, in February, when we come together with 20 or so others to discuss what we want to make of our lives, it’s hard not to get planning! Media has a powerful influence on our world. We believe excessive negativity in the press is destructive for society, so instead we are working to create a more constructive and compassionate media. To do this, we urgently need your support.